Welcome to Namibia – the land of friendly faces, wide-open spaces, and great wild places! By now you’ve read all about its conservation successes, groundbreaking sustainable development policies, and local empowerment initiatives. Crowned as the jewel of Africa on the Forbes top three travel destinations for 2015, and highlighted as Lonely Planet’s number two on the Best in Travel 2015 list, it’s on the lips of many a travel guru. The guidebooks and internet sites have recommended the top to dos and must sees, and you’ve come all geared up for the occasion: sun hat swinging around your neck, binoculars and zoom lens within reach, and mosquito repellent in your back pocket (especially if you’re going up north during the rainy season). But how prepared are you really for the first introduction to this African experience of a lifetime? The official entry to Namibia is routed via the country’s one and only International Airport (except if you opted to take the less obvious path via the coastal port of Walvis Bay). Named after the great chief Hosea Kutako – considered a national hero because of his role in the country’s fight for independence, and founder of our first nationalist party, SWANU – it is here where you’ll be greeted with the first set of surprises. For starters, the journey from the aircraft to the arrival terminal is done on foot, and the building itself qualifies to land up on the list of smallest airports in the world. Listings aside, the custom officials are efficient, and if you haven’t taken any chances to smuggle illegal substances into the country, you might very well find yourself on the long stretch to the capital within less than an hour after landing. It’s this very extension of motorway – officially known as the Trans-Kalahari Highway – that acts as the opening presentation of 6 664 km of smooth, un-potholed, bitumen surface, forming part of a well-established road network of over 46 645 km that stretches across this vast land. 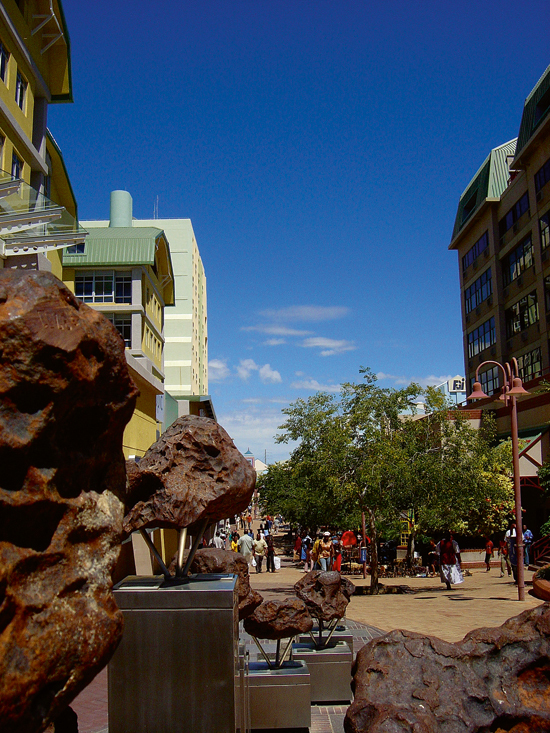 Windhoek is often described as a city with a ‘continental’ atmosphere, and with good reason. As you enter official city boundaries, expect to be welcomed by lifestyle villages and housing estates, constructed in a fashion very much like those in other parts of the globe. Closer to the centre, historical German buildings dominate the architectural vistas, while informal settlements bring the beat of a modern African city. Of course, formerly, long before contemporary urban developments like traffic lights (locally known as ‘robots’), high-rise buildings, or one of the largest shopping malls in Africa (the Grove Mall at 55 000 square metres is the biggest in Africa outside South Africa), life here was different. Back then, in the early 1840s, the capital didn’t consist of much more than a homestead located in the airy basin between three mountain ranges, ruled by Captain Jan Jonker Afrikaner. Jan was the same Afrikaner who was responsible for the name the city carries today, changing it from the original /Ai/ /Gams and Otjomuise – both referring to the occurrence of hot springs in the area – to that of Winterhoek, which under German rule became Windhuk, and subsequently, Windhoek. The Windhoek of today has all the amenities of any other modern city, plus a few extras, like drinkable tap water and some of the cleanest streets on the planet. And as the country’s main hub of activity, the city has much to offer the weary traveller. Perhaps a good way to ease into the experience is to book a tranquil afternoon in one of the city’s exclusive spa facilities, of which the Diplomat Hydro Spa, Oukole Day Spa and Nomad African Spa are prime examples of pampering and relaxation. Other means of adjusting to local life might entail a sundowner of choice at one of the city’s ‘look-out’ points, with Am Weinberg, Hotel Heinitzburg, the Wine Bar, and the Hilton Sky Bar boasting the most romantic city views, topped with some very impressive wine selections. If you prefer to be on ground level, the Stellenbosch Wine Bar is another renowned spot for connoisseurs, with additional drawing cards like a tasting room, bistro and speciality restaurant. 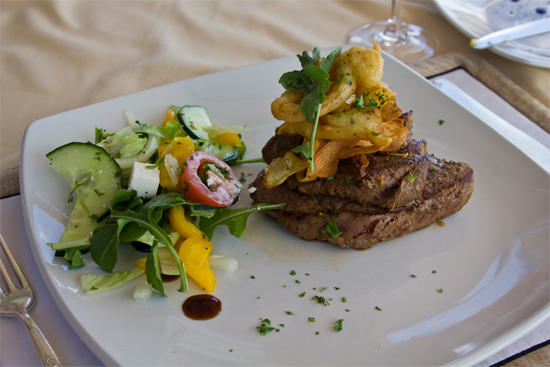 For the culinary curious, visit the world-famous Joe’s Beerhouse to experience the flavour of Namibia’s prime export quality free-range beef from Meatco’s ‘nature reserve’, or leaner home-grown meat varieties like kudu, gemsbok, zebra, or hartebeest. Gathemann’s is another popular choice, with gourmet food handcrafted from the finest ingredients, served within a historical setting. As one of the earliest German-designed buildings to pop up in the city, it looks out onto Independence Avenue and the city’s greenest spot, Zoo Park. The park itself hosts some interesting memorials, including one marking the spot where elephant bones were excavated in the fifties. It also plays host to the annual /Ae/ /Gams Arts and Culture Festival, celebrating the cultural diversity of the city. Apart from its notable reputation as a conservation destination, Namibia is also well known as one of the world’s top-notch producers of diamonds. Fine specimens of these shiny little forever stones are cut, polished, shaped, and available to take home at the Diamond Works. 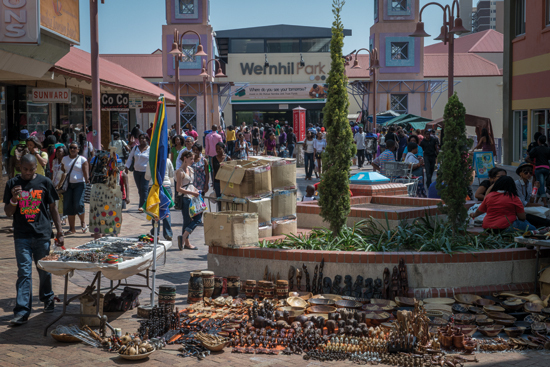 Located within the Old Breweries Complex, it is worth a stop even if just to pass through the Namibia Craft Centre, with its array of authentic hand-made goods. Putting all 824 269 square kilometres of the country together under one roof, the centre creates opportunities for local artists, craftsmen and communities to build profitable businesses, ranging from unique folk art and fashionable embroidery to contemporary jewellery and sought-after designs. Other local producers worth a visit, are Casa Anin, where hand-made Namibian linen and home textiles reign supreme; Nakara, home to Swakara garments and world-renowned leather goods; and Pambili Young Designers and My Republik, both showcasing the latest fashions by local designers. There’s also a selection of state-of-the-art shopping malls, with all the top chain stores (minus McDonald’s), coffee shops, and eateries in between. Men, or other non-shoppers, can keep themselves occupied by hitting a few balls around the 18-hole, fully grassed, par-71 course at the Windhoek Country Club, or by taking part in one of the sporting events listed below. Night owls and culture seekers will also be happy to know that there is a constant selection of music concerts, theatre performances, exhibitions, and local and international film screenings, hosted by establishments like the Warehouse Theatre, National Theatre, National Art Gallery, Omba Gallery, Goethe Centre, Franco-Namibian Cultural Centre, and College of the Arts. For a complete list of events, dates and tickets, visit www.staytoday.com.na.